Makers of True-Bake Crackers, True-Blue Honey Grahams, English Style Biscuits, Krause's Chocolates, Florizel Chocolates. 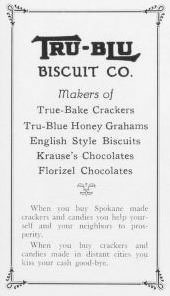 When you buy Spokane made crackers and candies you help yourself and your neighbor to prosperity. When you buy crackers and candies made in distant cities you kiss your cash good-bye.